1. Introduce the concept and vocabulary by asking open-ended questions: * What are some things that can fly? * Tell me where you might see these things. * What is your favorite thing that flies? Why? Hold the book, calling children’s attention to the title. 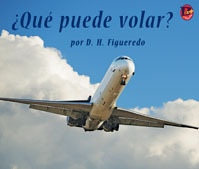 Read: "What Can Fly?" Ask children to predict what kinds of flying things they might read about. Show the back cover and read the copy. Ask children what similarities they see between the eagle and the plane on the front cover. Give children the book and have them look at the photographs. Ask them to notice all the things that fly. Encourage children to look at the photographs and the beginning sound of the word. The title ends with a question mark. The book contains familiar words: fly, bee, bird, bat, fish, kite, balloon, plane, rocket. The text is below the photograph on each page. Only one word changes on each page; that word is the second word in the sentence. The exception is page 12, where “And” is added at the beginning of the sentence. The sentences ends with an exclamation point. 1. Set a purpose by telling children to read the book and find out what can fly. Have children read quietly but out loud. Each child should be reading at his or her own pace. Children should not read in chorus. Listen to children as they read by leaning close or bending down beside each child. Do children look at the photographs before they read the text or after they read? Do their eyes go up to the photo before reading the new word in the pattern? /p/-/l/-/a/-/n/-/e/ or blending the sounds? As children read, suggest a reading strategy if they are struggling: "Try looking at the picture to make sense of the print." Encourage children to take a guess or use the beginning letter sound. Review using the photograph to help with each new word. Review using initial consonants and blends, and long-vowel sounds to read new words. Model how to reread the sentence if it does not sound right or make sense. Call attention to all the high-frequency words children have learned and used. Provide help with reading two-syllable and three-syllable words. Call attention to the question mark used in the title. Call attention to the exclamation point on the last page. 1. Have children confirm their predictions about what can fly. Model how the title should be read differently because of the question mark and the last sentence because of the exclamation point. Discuss what the bee, butterfly, bird, bat, and fly have in common that enables them to fly (wings). Study the photo of each animal and talk about the differences and similarities among the wings. Have children speculate about why being able to fly is helpful to animals. Then talk about how being able to fly is helpful to people. Have children look carefully at the shapes of the animals that fly and the shapes of the human-made items that fly. What comparisons and generalizations can children make? Ask children to imagine that they can fly like a bird or a butterfly. How do they think it would feel? Would it be fun or scary? If any children have flown in an airplane, let volunteers tell about the experience. This is a time for assessment. While children are reading, watch what they do and what they use from the teaching time. Alternatively, you might take a running record on one child as an assessment of the child’s reading behavior. Have children brainstorm other things that can fly and record their responses on a chart. Let each child select four items, make a drawing of each on a separate piece of paper, and write a complete sentence below using the sentence pattern “A ___ can fly.” Staple the pictures together and let children share their books in small groups. Children may enjoy making small kites from paper plates or a kite shape cut from construction paper. Let children color their kites with crayons, markers, or sponge painting and decorate them with glitter, streamers, and so on. Display children’s kites on a bulletin board or as kite mobiles made by attaching the kites to wire hangers. Read children the Bebop title Leo and the Butterflies. This story introduces several types of butterflies, the life cycle of a butterfly, and the workings of a butterfly farm in a rain forest. Present the concepts on a level appropriate for your class. The book may also be used as a starting point for additional study of butterflies. Have children create paper airplanes using firm construction paper. Either in the classroom or outside, let each child fly her or his plane and measure the distance the plane flies. Record the distances on a chart. Then try altering some planes by adding a paper clip to the nose, tearing a tiny notch in the tail, or adding a small leaf or twig to each wing, and fly them again. Discuss how the alterations affected how far each plane flew. Teach children the words and movements to the song “I’m a Little Airplane.” Lyrics and suggested actions may be found at the following Web site. Other airplane song activities are also provided there: http://www.preschooleducation.com/sair.shtml. Let children select either a hot-air balloon or a rocket and imagine they are flying in that vehicle. Have children write about what they see on their journey. They may write about real and/or imaginary things they encounter. The Spanish edition also uses a patterned sentence and familiar words: abeja, mariposa, pájaro, murciélago, pez, cometa, globo, avión, cohete, mosca. Because many children speak dialects or may mix Spanish and English, you may need to help children understand that “book language” does not always match the words we use every day. Guided reading levels were assigned by certified Reading Recovery® teachers and literacy experts using the guidelines identified in Guided Reading and Matching Books to Readers by Irene C. Fountas and Gay Su Pinnell (Heinemann). Intervention levels were assigned by certified Reading Recovery® teachers and literacy experts and are intended for use in early intervention and one-on-one tutorial programs, including Reading Recovery® programs. These levels were not officially authorized by Reading Recovery®. Reading Recovery® is a registered servicemark of The Ohio State University. DRA (Developmental Reading Assessment)/EDL (Evaluación del desarrollo de la lectura) levels were determined using information in the Developmental Reading Assessment Resource Guide and EDL Resource Guide by Joetta Beaver (Celebration Press). All level placements may vary and are subject to revision. Teachers may adjust the assigned levels in accordance with their own evaluations.